Texas Rangers Cards: 1978 Topps - Mike Hargrove. Coming into 1978 Mike Hargrove, seen here on #172 of the 1978 Topps set, was looking to build on his successful 1977 season. Hargrove had managed to improve defensively and offensively in 1977. If he could make more improvement he might be able to get back to his 1974 form. Hargrove appeared in 146 games for the Rangers in 1978. All but six of those games were at first base. Four more were as the Designated Hitter and two were pinch-hit appearances. Over the 1124.2 innings Mike played at first he made 17 errors and ended the season with a .987 fielding percentage. That was a six point drop from 1977 and five points below the league average. Mike made 616 trips to the plate for Texas and put together a .251 batting average and a .388 on-base percentage. The batting average was a 54 point drop from the previous season and the on-base percentage fell by 32 points. Hargrove's power also deserted him as he hit 24 doubles, one triple, and seven home runs. All were less than in 1977 and the home runs fell by over half. 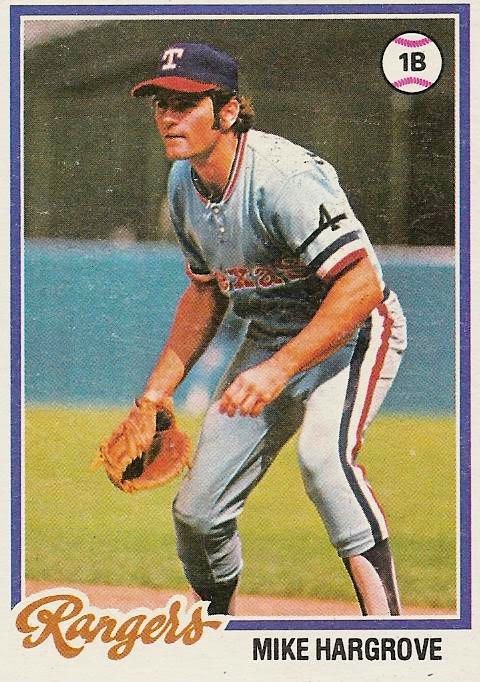 Perhaps the brightest spot offensively for Mike was his league-leading 107 walks. Well, Hargrove hadn't been able to build on his 1977 success. He was quickly developing a pattern of doing well on odd-numbered years and stumbling on even numbered ones. If the pattern held true then 1979 should be an up year. The question was, would the Rangers have the patience with Mike to give him another year?